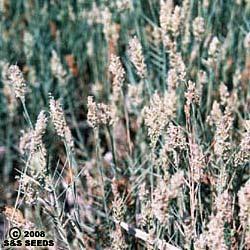 As the name implies Salt Grass is native to salt marshes and seepages. It spreads from rhizomes, and has potential as coarse turf in difficult areas. It is tolerant of heat, drought, salty or alkaline water and soil, and is tough and resilient, making it a useful choice for large-scale coverage, erosion control and coastal restoration work. It is a warm season grass with gray-green leaves, that does well in sun with some summer water. It is a food source for butterfly larvae.